You might remember my pineapple & avocado salad. So all the pineapple wouldn't fit back in the pineapple once the avocado was added so I had a bit spare. 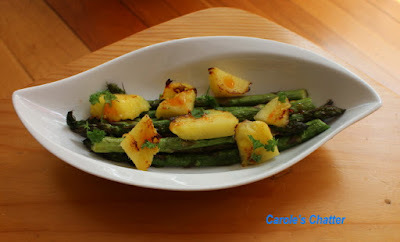 I also had a few spears of asparagus left after making my asparagus and raspberries. That's how a dish gets born. I steamed the asparagus lightly. I then grilled both the asparagus and the pineapple and topped the dish with sweet chilli sauce. Garnished with a little chopped parsley. Simple and delicious. This isn't a combo I would have ever considered, but I'm intrigued! thank you for visiting. I would never have considered this combo but I like the idea. Have a good day. Such a colorful combination and love the sauce with it.